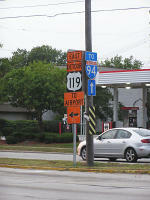 WIS-119 - Anonymous No More! 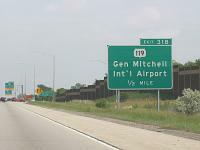 Wisconsin Highway 119 has existed in anonymity since it was first applied to Milwaukee's Airport Spur in the late 1970s. While the route was designated WIS-119 by WISDOT, and appeared on maps designated WIS-119, no signage actually existed on or near the route -- until 2007, when new signs on I-94 clearly featured WIS-119 shields! 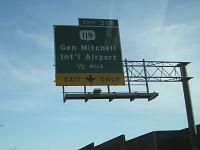 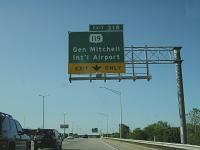 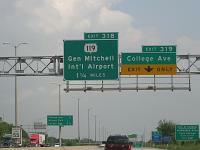 Previously, signs only read "Gen Mitchell Int'l Airport" or "Airport Exit", however, WISDOT received a number of complaints from drivers about this highway that they couldn't find, according to the April 29 Road Warrior^ column. 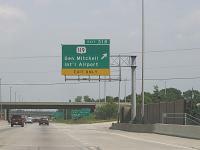 I have captured three of the six currently existing signs on I-94, though WISDOT plans to add signs to the route itself as well in the near future. 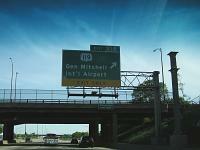 For more information, see the wisconsinhighways.org WIS-119 listing^.